Alphaville is a German group which gained popularity in the 1980s. The founding members were lead singer Marian Gold (real name: Hartwig Schierbaum, born 26 May 1954 in Herford, North Rhine-Westphalia), Bernhard Lloyd (real name: Bernhard Gößling, born 2 June 1960 in Enger, North Rhine-Westphalia), and Frank Mertens (real name: Frank Sorgatz, born 26 October 1961 in Enger, North Rhine-Westphalia). The band was at first named “Forever Young” before changing to “Alphaville”. 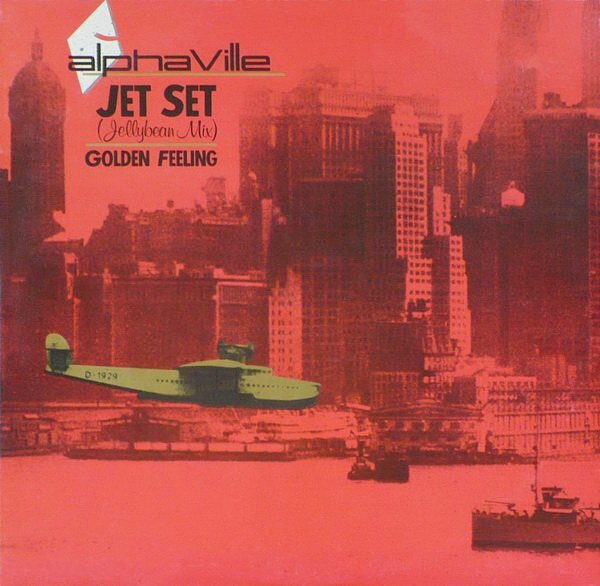 Jet Set was the fourth and last single from Alphaville’s first album, Forever Young, and was released in March 1985. Re-recorded and released after founding band member Frank Mertens left the band, the 7″ version drops the ‘The’ from the song’s title and is mildly different from the original album version. “Jet Set” was remixed by John “Jellybean” Benitez for the 12″ single release.